The 2004 FEIS/EIR includes taxi service. Specific curbside passenger loading and unloading space for taxis is proposed along the south side of Minna Street between First and Second Streets, along the north side of a proposed new section of Natoma Street between Beale and Main Streets, and along the west side of Main Street between Natoma and Howard Streets. 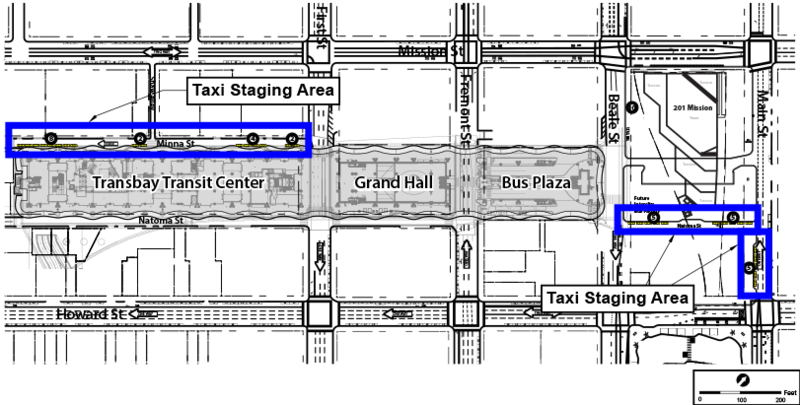 The proposed Taxi Staging Areas would be a convenience for passengers coming to or leaving the Transit Center.